We know that gyms can sometimes be intimidating places. We also know that personal trainers can be intimidating people. The stereotype is out there: Personal trainers are muscle-heads and drill sergeants. They are so super-fit and so super-strong that they can't relate to their clients, especially those clients who are new to gyms, new to exercise and new to nutrition. Personal trainers are expensive. Personal trainers aren't effective. Personal trainers aren't worth it. Well, we're here to tell you that while some personal trainers may fit that description, we at Momentum certainly don't. 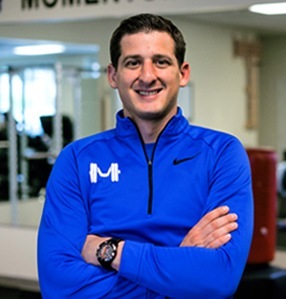 Jeff McConville is a personal trainer, entrepreneur, and owner of Momentum Personal Training, LLC. He has been active in the fitness industry for over five years and is a veteran trainer. He believes that every one of his clients should have a well-rounded approach to their fitness that includes weight and cardiovascular training with a strong emphasis on nutrition. Jeff makes himself unique in the industry by providing scientifically sound, effective and private training sessions that get clients results quickly and safely. Jeff takes his clients success very seriously and is engaged in every single repetition his clients perform. Although he takes training seriously, Jeff is never short of fun and enthusiasm and can often be found cheering on his clients or drawing funny pictures on his motivation board. Jeff prides himself in the success of his clients and always goes out of his way to put them first. As a business owner Jeff has an extremely strong work ethic and isn’t afraid to take on any task. He loves using his wit and creative problem solving skills to fine efficient and unique solutions to complex situations. Always calm under pressure, Jeff thrives in a fast pace work environment and loves challenging projects. Jeff strongly believes that no one is successful alone and will rely on teams of experts and employees to help him with marketing and business growth strategies. A strong entrepreneurial spirit separates Jeff from most as he constantly is developing new ideas and trying to make his business practices as efficient and self-sufficient as humanly possible. Jeff truly enjoys running businesses and is always looking forward to the next opportunity. Personally, Jeff lives in Frederick, Maryland with his wife Kelly and German Shepherd Dog Ramses. He enjoys a very active lifestyle and loves working with his hands and learning new skills. He is a private pilot, avid motorcycle rider, marksman and has his Black Belt in HapKiDo martial arts. You will never find him sitting still, and when he’s not working, Jeff finds relaxation in building projects and vehicle mechanics. Jeff hopes to on day to focus on international missions work and ministry with his church and use his skills in developing nations. 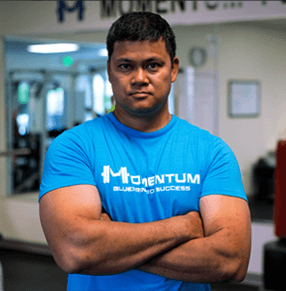 Wendell is a personal trainer and martial artist from the Island of Hawaii and has been involved in the fitness industry for over 20 years. As a trainer, Wendell likes to incorporate plyometrics and Muay Thai Boxing into his workouts as well as traditional lifting. He takes time to properly instruct clients on form and teaches how to mentally approach their exercise and goals. Before moving to Maryland in 2014, Wendell attended the University of Hawaii and walked onto their basketball team and earned his scholarship junior year. While attending UH, Wendell was first exposed to weight training and conditioning while on staff at the UH Athletic Department, and became specialized in plyometric training and ran the plyometric programs for multiple sports teams at the University. Wendell knows what it takes to play for a D1 athletic program and his experience has made him an excellent trainer for student athletes. Also while in college, Wendell began learning Muay Thai Kickboxing and within 3 years he became the president of the HMPA School of Muai Thai. In 1998 Wendell founded the Laupahoehoe School of Muay Thai on the Big Island of Hawaii. Later he moved his school to the Island of Honolulu where it is currently being operated by his instructors. As the instructor of his school, Wendell has traveled to Thailand to continue learning the arts of Muay Boran, Krabi Krabong and Muay Thai as well as competing in boxing matches. Stacey is an exercise therapist, nutritionist, and personal trainer that has been training for over 25 Years. Stacey specializes in preventative healthcare and works with progressive diseases and developmental disabilities as well as those coming out of physical therapy who are still in need of rehab. She has an overall commitment to improving the quality of life for people through movement and nutrition. 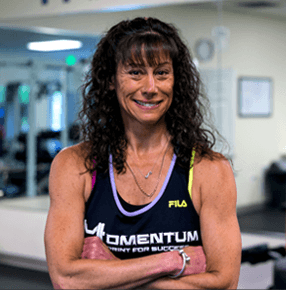 Stacey branches in to all facets of the fitness industry including, coaching track and field, massage therapy, and body building. She is a very experienced and well-rounded trainer. Stacey never gives up on any individual; even the most challenging clients. She has experience working with quadriplegics, paraplegics, severe brain injury, spinal cord injury, cancer patients, MS, ALS and a number of other medical conditions. Stacey is active in the local medical community at various hospitals and rehab centers. She always continues to practice what she believes, “that all things are possible" and through a caring faith and determination, miracles do happen. She has been blessed to witness many successes over the course of her career and each one makes her feel that exercise therapy is a rewarding career. We Don't Yell. We Motivate. We hear it all the time from new or prospective clients: their No. 1 fear if they hire a personal trainer, will be they are pushed too hard, forced to do exercises they're not comfortable with or yelled at when they fail. It's understandable but it's not your experience with Momentum. We strive to create a friendly, fun atmosphere that allows our clients to thrive and grow into their personal training routine. We motivate you. We encourage you to push forward. But we'll never push you too hard, and we'll always listen to your concerns.